Six litres of the fantastic brut Champagne from Pol Roger. The equivalent of 8 regular bottles presented in the one large format. 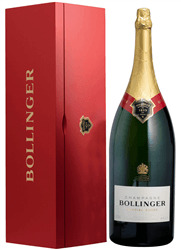 The bottle is delivered in its own Pol Roger Champagne wooden box as shown. 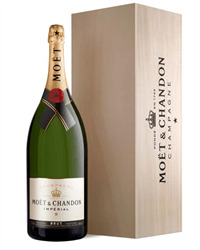 Send a Methuselah of Champagne, pouring 48 glasses each it's the perfect gift for a celebration. 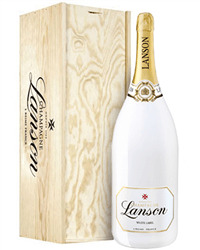 Our range of Methuselah of Champagne gift - 6 litre bottles includes champagnes from Laurent Perrier, Lanson, Moet et Chandon, Veuve Clicquot and Pol Roger. Order online or by phone and we will deliver to the address of your choice, beautifully packaged in its own wooden presentation box. What is a Methuselah of Champagne? A Methuselah of Champagne is equal to 8 standard Champagne bottles. How many liters of Champagne in a Methuselah? A Methuselah of Champagne holds 6 liters of Champagne. Which Champagne bottle size is smaller than a Methuselah? 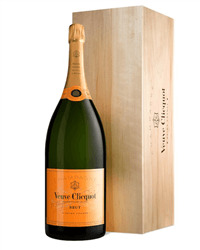 A Jeroboam of Champagne is the next size down and holds 4 liters equal to 4 standard bottles of Champagne. What is larger than a Methuselah of Champagne? A Salmanazar of Champagne is the next size up and holds 9 liters equal to 12 standard bottles of Champagne.